I draw so much inspiration and fuel from church. My hope is that everyone who attends church can apply the message that is taught to their own lives. If they can’t, they should come listen to Greg Surratt. Weekly, he touches my heart with his words and inspires me for my upcoming week in the classroom. In reality, he is a teacher just like me, and the way he presents his lessons are concrete and applicable. In my eyes I should be doing the same thing, inspiring my kids and making them apply lessons to their own lives. His message this week, was to watch the things we say because even when we don’t think we cause harm to others with our words; you never know how what we say can effect people differently. My students STRUGGLE with watching what they say. They are fourth graders, so hormones and self esteem issues are starting to kick in. Pair that with spring fever, and it is disaster waiting to strike. Zoe checks comments on her blog. All year I believe I have taught them how to treat others, but since spring break, our mantra has been, “treat other’s the way you want to be treated”. It is important for them to understand how deeply words that they say can cut into their peers and in the long run make them seem like an unkind person or worse, a bully. I also have to think about what I say to my kids on a daily basis, and how I say it to them. My husband has lovingly pointed out to me that it isn’t always what I say that hurts, but how I say it. In the classroom I always try to keep an even tone and give words of encouragement daily, but I know some days I don’t give as much praise out to students as I should. How are our students handling speaking to others in the digital world? Are they giving supportive advice during small groups or are they cutting down other students with disrespectful comments? Digital citizenship is something we must teach our students if we are giving them tools to touch the world; even if we don’t allow students to comment on a global scale, that doesn’t mean they are not smart enough to figure out how to do so. Friday afternoon hits the week before our state standardized testing, and I am all packed up to go home with one foot out the door when I hear my desk phone ring. UGH! Little did I know that on the other line I would find a teacher from New Jersey and not a parent. This particular teacher uses the Itooch app in her Ipad pilot classroom, and some one from Drayton Hall has been commenting to her students in the game center. With a little bit of searching on the internet, she was able to find my information and classroom phone number, and presto we are handling classroom issues thousands of miles away. We are now in a world in which we have to deal with global behavior issues, not just those within our school walls. In the digital world it can also be extremely difficult to figure out a person’s tone when reading text on a screen. 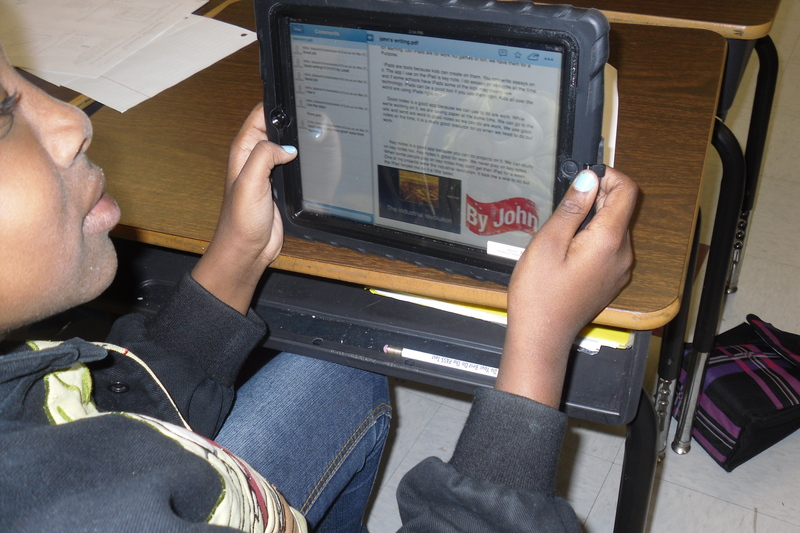 My students read comments from each other all of the time on their iPads. 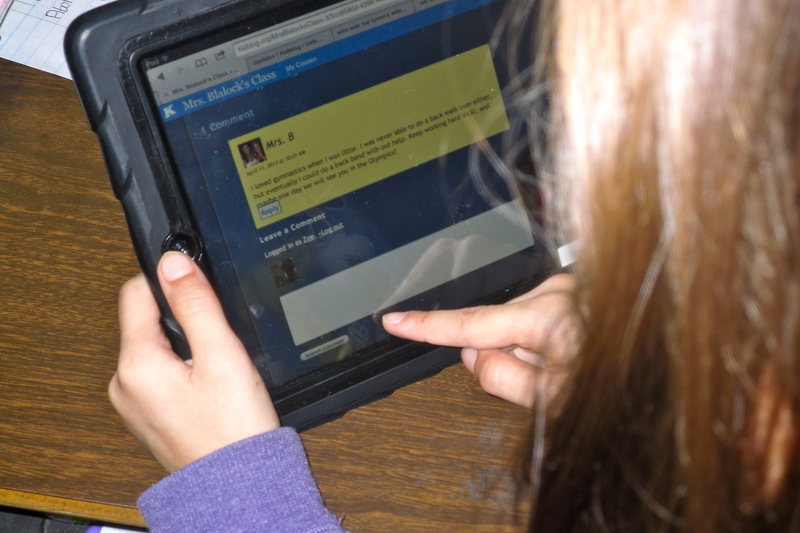 Whether they are reading comments on their individual blog posts or are checking classmates comments on a writing assignment on the Box app, they have the overwhelming ability to comment on each other’s work and either build each other up or break each other down. We have to model how to give constructive criticism and when we should keep that “little voice” inside our own minds. What have you said to your kids over the past week to inspire them or touch their hearts? How are your students dealing with digital citizenship? How do they talk to each other in small groups inside of your classroom? I am sure all of us could use that little bit of extra positivity and encouragement, so let’s model how to do this with our students! You are welcome to download my newest classroom poster THINK!.